Deoghar: Vodafone India, one of India’s leading telecommunications service providers, in its endeavour to promote responsible mobility, organized ‘Tour De Deoghhar’ – a 250+ kms long cycle ride from Ranchi to Deoghar, to educate people in the state about the importance of road safety and observing traffic rules. The initiative was undertaken in association with the Ranchi Cycling Club, an association of cycling lovers in Ranchi. Employees of Vodafone Bihar & Jharkhand Circle and members of the cycling club participated in the campaign, riding though breathtaking hills and picturesque forests of Jharkhand spreading the message on health, safety & wellbeing among the citizens, emphasizing on the fundamental traffic rules and highlighting the basic precautions a commuter must take while on the move. 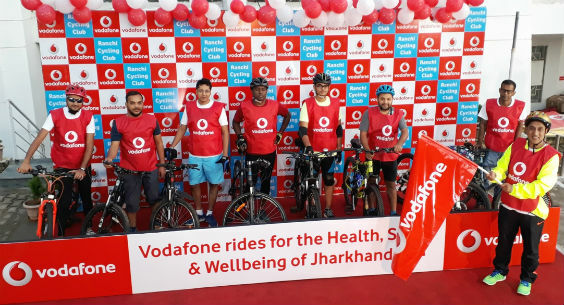 ‘Tour De Deoghar’, the two-day Cycle Ride was flagged off by Rajshekhar Metgud, Business Head, Bihar and Jharkhand Circle, Vodafone India from Vodafone Circle Office in Ranchi. The ride covered key locations en route, passing though Mesra – Phusro – Dumri – Giridih – Bengabad – Kakti, before culminating at the Vodafone Mini store in Deoghar. As part of the campaign, Vodafone employees also distributed leaflets to commuters and communicated with them to promote the Absolute Safety Rules of the company and spread awareness on health, safety and wellbeing. Commenting on this initiative, Rajshekhar Metgud said, ‘Vodafone, as a value based organization, is passionate about people and is committed to achieving the highest standards in health, safety and well-being for all our stakeholders, in the environment that we operate in. We always believed in reaching out to people and creating awareness on crucial social issues. We work toward promoting these virtues within communities and ensure a safe working environment. I would like to extend my gratitude to the state government and Ranchi Police who have helped us with all possible support in taking this noble initiative to the next level for greater reach across the state. I would also like to thank members of Ranchi Cycling Club who have extended valuable support to the cause’. Vodafone India is one of the pioneers in the service sector to observe a stringent HSW (Health Safety and Wellness) Policy. As a value based organization, Vodafone India is passionate about people and committed to achieving the highest standards in HSW, with the aim of providing and maintaining a safe and healthy working environment for employees, associates, customers, community and wider public at large. The Company’s HSW (Health, Safety and Well being) policies for employees are amongst the best in the industry. Absolutes Safety rules (ASR) has been developed for health & safety. These rules are not only for health & safety at work place but also to be implemented at home. These rules primarily focus on three key risks- Electrical safety, Height Work & Road Safety. A strong commitment to Health safety well being and zero tolerance to distracted driving witnessed first of its kind study released by Vodafone India Ltd sand SaveLIFE Foundation and under the theme of ‘Safety in Mobility’. The report titled, ‘Distracted Driving in India: A Study on Mobile Phone Usage, Pattern and Behaviour’ reveals 94% of people acknowledge using mobile phones during driving is dangerous but 47% of them admit they do receive calls while driving. Vodafone-SaveLIFE Foundation has also launched a ‘Road Safe’ mobile application which aims to keep drivers away from distractions while driving, and also providing useful tips for safe driving. ‘An alarming rise in incidents of road accidents due to distracted driving has highlighted the need for disciplined driving and stringent adherence to traffic rules. Therefore, through the Road Safe mobile app we hope to save many lives and alert citizens on hazards of distracted driving. The app will help drivers remain distraction-free while driving. Vodafone also takes this opportunity to urge citizens of the state and those travelling to and from the state, to observe traffic rules and stay safe’ added Rajshekhar Metgud. Distracted Driving in India’, a first of a kind study report released in the country was based on a survey conducted by international research agency Kantar Public covering 8 cities with a total of 1749 respondents covering four typologies of drivers: two-wheelers, three-wheelers, four-wheelers and truck/bus drivers.